Tips for Towing Your SXS/UTV | Intimidator Inc.
Part of the excitement of owning a UTV is being able to take your utility vehicle on trail rides, explore new locations, and go on once-in-a-lifetime hunts with friends. And since not everyone has a truck with a bed large or long enough to haul a utility vehicle or ATV, this can sometimes mean loading your UTV onto a trailer and traveling several miles to your destination. Here are a few tips for towing your SXS/UTV safely to your next destination. Some people just tie up their side-by-side and toss in a few extra items like coolers and head out. Don’t do that. Take time to organize your load on the trailer. First, you want to make sure that the weight is symmetrical and centered over the front axle. Some people like to follow the 60/40 rule where you place 60% of your total load towards the front of the trailer. Having too much weight in the back of the trailer increases the chances of the hitch popping off. It also causes the trailer and the tow vehicle to be unsteady and unstable which can become very dangerous on an open highway. Too many times accidents happen because someone is too busy to ask anyone for help. When getting your rig ready to load up on the trailer, it’s always a good thing to have at least one other person. This person can help you maneuver the tow vehicle so that it is easier for you to load your UTV, help you get centered on the trailer, and even help you secure your utility vehicle(s) to the trailer. Loading a trailer the proper way takes practice and patience. It’s also good to ask questions if you don’t know for sure how to do something. Not sure how much weight your trailer can hold or if you have the right type of straps? Ask or call someone. It’s better to learn how to do things the right way instead of risking your safety and the safety of others. Before you get on the road, it’s important to take note and make sure that your trailer and your SXS and other equipment are fully secured. Investing in the items below can make a big difference between getting to your destination safely and having a major accident on the way. D-rings - These add additional hook points to your trailer. They can also help with straps rubbing against the steel frame of the trailer and possibly breaking. Ratcheting Straps - These types of straps are perfect for larger cargo like a side-by-side/UTV. Breakaway Chains - These chains can really make a difference in the event that your trailer becomes loose while you are driving. Criss-cross the chains to help keep your trailer straight and stable. Safety Chains - Like breakaway chains, safety chains should also be criss-crossed. They help out if the hitch connection fails. You can even add breakaway brakes to your trailer that apply braking when your trailer is separated from the towing vehicle. Lights and Signals - It’s important, and in most states it's the law, to make sure that your trailer is equipped with working lights and signals. Brakes - Your trailer should have some sort of braking mechanism. Not only does this help in case of an accident, but it also helps when towing heavy utility vehicles. These are just a few of the items that can help with towing your side-by-side. Remember, towing a trailer is a much bigger deal than just driving your truck. Take the time to take precautions and safety measures and get your trailer loaded the right way. Drive slower. Remember, it will take a little more time to accelerate with a larger load, and it will also take a little more effort to come to a stop. Try practicing on private property or shorter trips before taking your SXS on a cross-state or cross-country adventure. 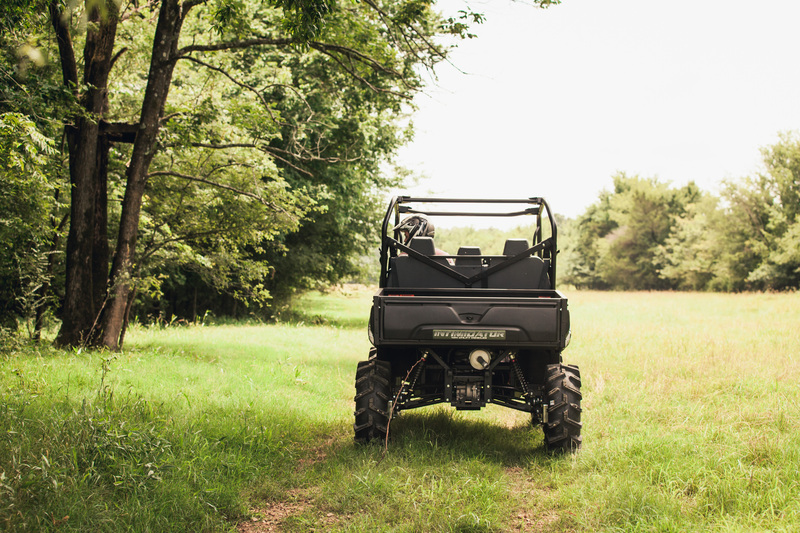 Intimidator builds UTVs so that you can take on tough jobs, hunt, and play hard. Check out our most popular models for flying through trails and stirring up the dust with family and friends. 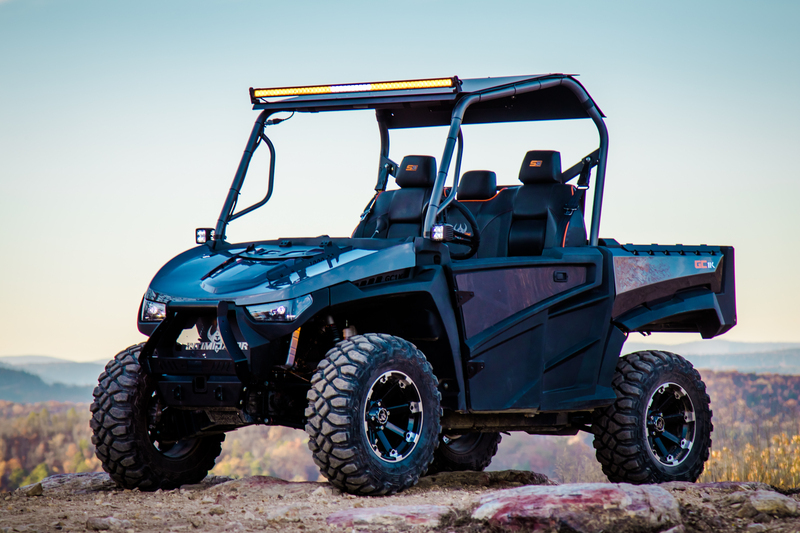 The Enforcer is equipped with the Intimidator 800cc gas engine and allows you to take on trails up to 50 mph. And if you need a little more height, the Intimidator Enforcer has 18 inches of ground clearance and a factory installed 4-inch gear portal lift. 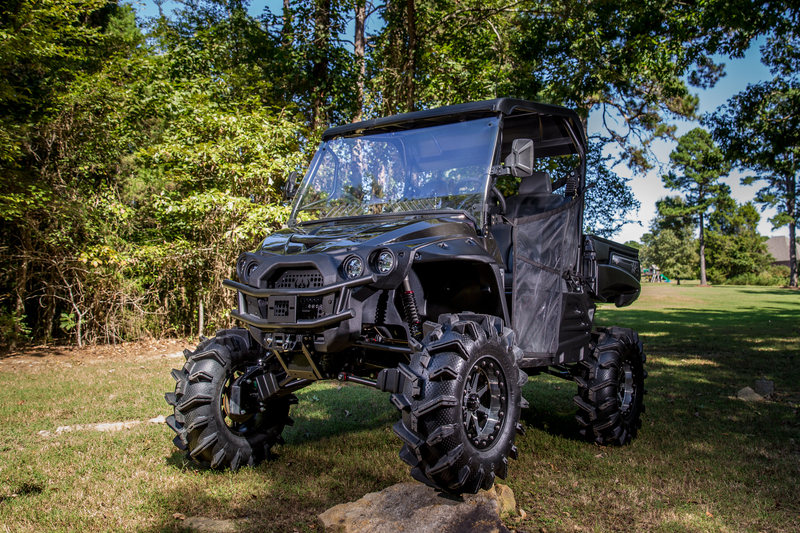 And with 32" motoboss 6-ply tires and true beadlock MSA wheels, this side-by-side ATV is ready to take you where you want to go! Do you have a need for even more speed? If so, then you will really want to check out the Intimidator GC1K Series. Not only is this ride fast with speeds up to 65 mph, but it also leads the industry with 83 HP. It also has THREE different stages so that you can get the side-by-side that delivers exactly what you need. Check out these rides in person by visiting an Intimidator Dealer near you. Come see the unparalleled power, strength, and performance that is Intimidator. You won’t be disappointed.